No matter what you'll do, some types of gate problems can't be avoided altogether. Since they are not caused due to one or two specific reasons, there's only so much you can do to stop them from occurring. However, that doesn't mean there's nothing to be done. There sure are lots of ways to take care of your system and prevent a lot of issues. With complex mechanical systems like driveway gates, things tend to have a knock-on effect, which means nipping minor issues in the bud can prevent a whole slew of major problems from developing. When done properly and carried out regularly, gate maintenance can save you a lot of work, trouble and, money. Some may not appreciate the importance of regular maintenance, thinking that since some problems are going to rise up anyway why even bother? Well, the answer is simple. Without maintenance, a lot more problems are going to occur, and your gate is going to last for a very short amount of time. Regular maintenance allows you to eliminate all sorts of issues that won't just lead to worse problems, they'll also affect the performance of the mechanism. Regular inspections of the various hardware parts, and testing the safety features and the functionality of the intercom system will help you discover minor issues that you may have come to discover at far less convenient circumstances. It's important that you make sure the physical appearance of your gate is pristine. This isn't just for aesthetic purposes. Wrought iron bars can rust, and if the paintwork is chipped it exposes the underlying material to moisture. The same goes for wood, which can begin to warp or rot if it isn't adequately protected. Both of these materials need regular repainting and cleaning in order to be preserved. If you have a sliding gate, there's also the matter of the track. All sorts of leaves, dirt, and debris can accumulate inside it, and create a blockage that will keep the wheels from moving smoothly, or at all. By cleaning the tracks regularly, you can ensure that the system can continue to operate without movement issues. If you have a swing gate, you should grease up the hinges every so often, to reduce their working noise and promote a smoother movement. Proper lubrication is very important, as it reduces the constant wear and tear these parts suffer from. 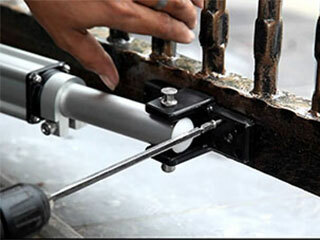 Your automatic gate is most likely equipped with certain features that prevent it from hitting objects or people. It's important that you test these features out on a regular basis in order to ensure that the system is still safe to use. The safety sensors of the opener must be in exact alignment with each other and their lenses need to be clean and undamaged.